A next-generation Russian airliner is set to take on foreign aircraft in the global market starting in 2015. Russian aircraft manufacturer Irkut Corporation is building the first three prototypes of what it is calling the Airliner of the 21st Century – the MS-21. This next-generation passenger jetliner is key to the Russian government's plan to develop civil aviation. The first prototype is expected to be rolled out in 2015, followed by certification one year later. The airliner is targeted at both the domestic and foreign markets. To survive in the current aviation market and compete against the best-selling aircraft types in its segment, the new Russian airliner will have to meet stringent criteria in terms of performance and fuel efficiency. Irkut says the MS-21 will have a lower empty weight than its competitors, as well as better aerodynamics and more efficient engines. Potential customers will be involved in the development process from the very first days. The MS-21 will be pitted against the latest modifications of the Airbus A320 and Boeing 737 narrowbody families. Even though Irkut lags behind in terms of annual production output (it projects its capacity at 40 airframes, compared to approximately 500 each for Airbus and Boeing), the positive market experience of another Russian jetliner project, the short-range Sukhoi Superjet 100, which is already in service with airlines around the world, is encouraging. 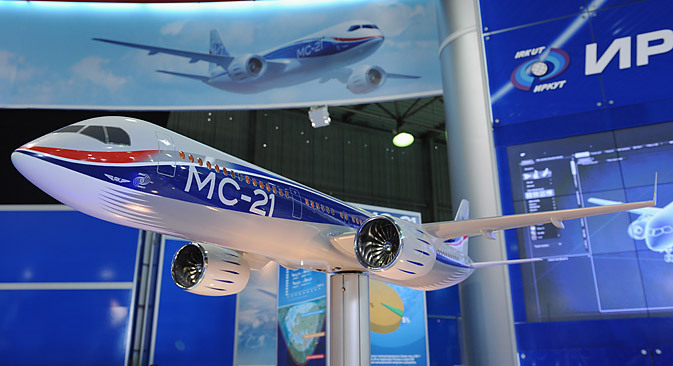 At the MAKS 2013 exhibition, Russia's United Aircraft Corporation signed $7.5 billion's worth of contracts, split evenly between the Sukhoi Superjet and the MS-21. "The Superjet 100 has been operated intensively in Laos and Indonesia since 2013," says Andrey Fomin, editor-in-chief of Russia's premier aviation magazine Take-Off. "Last fall, airliners of this type started flying in Mexico. They are performing quite well there, so it is possible that new customers will crop up in the near future, including from the Western Hemisphere. The marketing tactics used for the Superjet are now being proposed for the MS-21." There are currently around 170 orders for the MS-21, all of them from Russian carriers. The airliner is planned as a replacement for the ageing Soviet-made Tupolev Tu-134 and Tu-154 models, as well as for the younger Tu-204 type, which has proved uncompetitive on the global market. "If you want to get customers interested you have to come up with a completely new airliner," said Roman Gusarov, editor-in-chief of the Internet portal AVIA.ru Network. "This is what our aircraft enterprises, including Irkut, are attempting to do. All hopes for the resurrection of the country's civil aviation sector are pinned on the MS-21 program. If it proves a success, then another serious rival will emerge on the mainline passenger aircraft market."